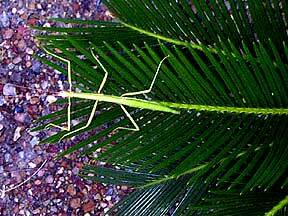 Walking Stick insect (Diapheromera femorata) on Cycas revoluta Sago Palm. Removing and planting the pups or suckers that appear on and around the mother plant, is really quite easy. (1) Remove pup by cutting or sawing from main trunk, some can even be pulled off. This will not hurt the cycad, unless trunk has been sawed into, then it becomes a matter of cosmetics. I let my pups set out for a couple days before planting. (2) use small pots, as larger one will be hard to water correctly and it will be a while before roots and plant are seasoned and established. If planting up many, use a planting tray as you would seed. (3) using a mixture of one part garden sand to one part Pete moss, fill each container to about 3/4 to the top of the pot. (4) push pup into pot so that about 1/3 of the bulb is into the soil. (5) water and place in a warm well lighted area. Do not keep pups water logged, as they will rot, let pots dry to about 1/3 down before watering. (6) Roots form from a few weeks to six months or more. After the pups sprout roots, new leaves will form, wait until leaves have hardened off before transplanting them into their own containers if using planting trays.